Bees play a very important role in our ecosystem: not only do they produce honey, but they pollinate our crops. 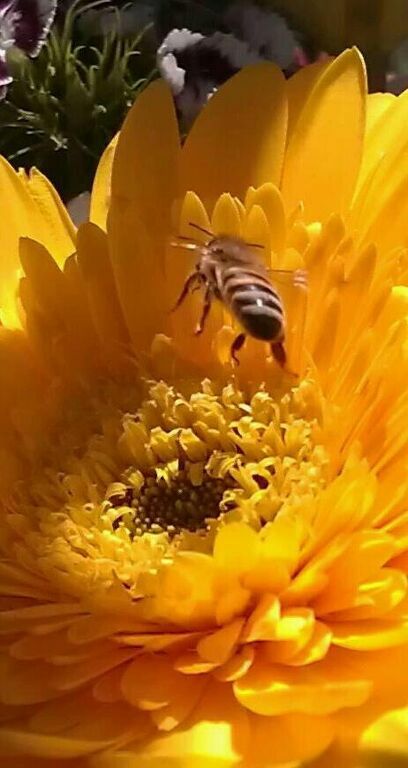 Without bees, we would not be able to grow our food. But how do bees get things done? They live in a complex social system where each bee has a role to play to ensure the colony's continued survival. There are three types of jobs within a beehive, each necessary and important. The queen bee doesn't really rule the hive, unlike what her name implies. However, she is the most important figure in the hive because she ensures the hive's continued survival. Her role is to produce more bees, which she does constantly: some queen bees lay about 1,500 eggs per day, and the queens can live two to seven years, meaning she will lay millions of eggs in her lifetime. Queen bees are marked as special at the moment the egg is laid. Most eggs are laid in a regular cell, but when it's time for a new queen to be born, the worker bees will construct a special queen cell that is bigger than the others. The larva in this cell will be fed a diet of "royal jelly," which is high in protein. Because of this special treatment, the insect will become sexually mature, unlike the other bees. What happens when a queen hatches depends on the circumstances. If it's time for the bees to swarm and find a new home, the new queen may leave with them. However, if the current queen is getting old and this new queen is meant to replace her, she will immediately seek out any rival new queens in the hive and fight them to the death. The old queen is usually allowed to stay until she dies a natural death. When the weather conditions are right, the new queen will seek out a drone congregation area, or a place where the male bees gather. There, she will mate with many bees and store the sperm in her body. When she comes back to the hive, she will stay there and use the stored sperm to produce eggs for the rest of her life, usually 2 to 7 years. Drones are male bees. They are unusual in that they only have one parent: to produce a drone, the queen will lay an unfertilized egg, meaning the drone has no father. Drones are larger than worker bees, have no stingers, and do not perform much work around the hive. Their primary purpose is to mate with queen bees. Drones are born in the spring. During the late spring or early summer, they leave the hive to visit drone congregation grounds, where they wait for a new queen to visit. No one really knows how drones and queens manage to find these areas-the bees use the same places every year, even though the bees that visit every year have never come before. When a queen bee visits the congregation area, the drones swarm her in an attempt to mate. Usually there are far too many drones to each mate with the new queen-only about one in 1,000 get the chance. However, the drones that do mate die shortly afterwards. The other drones return to their colonies. Drones can only be away for maybe an hour at a time before they have to come back for more food. If drones do not mate, most hives will kill or drive them out in the autumn so they don't consume precious food during the winter. Look after the queen bee (including feeding, grooming, and carrying away her waste). Clean the cells the queen lays eggs into. Feed the larvae that hatch from the eggs. Produce wax to fix up the hive. Make cells for storing food. Collect and store nectar and pollen. Carry away the corpses of dead bees. Keep the hive warm enough or cool enough. Guard the hive from intruders like wasps. Sometimes a worker bee can lay eggs. However, if she does so, they will be unfertilized, and the resulting bees will be drones instead of more worker bees. Bees are both fascinating and very necessary to humans. We need them if we want to keep growing food, and many scientists are still puzzled by their complex society. However, we may not want them in our yards. Sometimes hives can be removed from our properties without harm, when this is possible we will recommend live bee removal by a bee removal company. Other times they may be in a wall or in an area that can’t be safely removed and we can help with that issue.